This solitaire uses 52 cards (1 deck). You have 8 tableau column with 1 cards in each pile. Build the Aces up in suit to Kings. Cards are dealt to the tableau columns row by row. When one of the cards in the first row is moved to the foundation, the empty space is automatically filled with a card from the stock pile. The top and the bottom card of each tableau column are available to play on foundations. 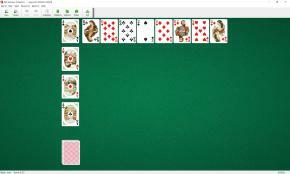 When there are more than two rows in the tableau, the cards that have an empty space above or below them are available for play to the foundations. When you have made all the moves initially available, click on the stock pile to deal another row into the tableau columns. The vacancies in the tableau columns are not filled. You win when all cards are moved to the foundations.